Whip up this Instant Pot or Ninja Foodi garlic parmesan whole roasted cauliflower in a hurry. Great for vegetarians as a hearty main dish or slice up and serve it as a side dish next to your main dish. 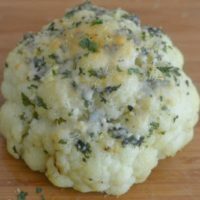 Zesty lemon, savory garlic, and butter come together for one of the most flavorful ways to serve up your cauliflower. 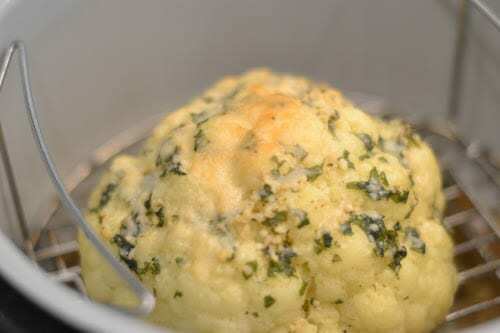 This Instant Pot or Ninja Foodi Garlic Parmesan Whole Roasted Cauliflower is so darn delicious I can’t decide if I want to eat it as a meal or as a side dish. I do know, I can not stop eating it. This makes for a delicious Keto meal or side dish. I love the ease of making this in my instant pot. It is cooked to perfection and the garlic parmesan really pushes this over the flavor edge and packs a great punch of flavor. The other night I was tired, it had been a long day and I needed something quick. Have you ever had nights like that? I went into the fridge and pantry and whipped up this garlic parmesan whole roasted cauliflower. It is such a simple side for my family, and it is truly bursting with fresh and zesty flavors. I used my Ninja Foodi to whip up my cauliflower. It has become an essential kitchen tool that is allowing me to cook incredible dishes and even desserts for my family and loved ones. This roasted cauliflower takes minutes to prep. I get it placed in the pot and do my crisping lid. This helps give you that slight golden crunch on the outside with a tender and soft cauliflower on the inside. Within five minutes I was ready to serve up this outstanding and light side. You will see that most heads of cauliflower will be around 2 pounds, which equals around 3-4 cups of cauliflower florets. This is a good gauge to know how many heads you need to serve your family. 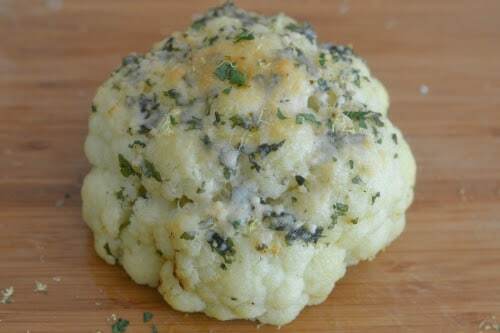 Many people reach for cauliflower because it is low in calories and full of fiber, which leaves you feeling full. This is a keto friendly recipe, and such a treat to make. Remove Leaves | Make sure to remove any leaves or extra stem off your cauliflower. I also always give it a good rinse before I prep my cauliflower head. Brush | I find using a brush is the best way to apply the butter mixture with all the seasonings onto the cauliflower. It helps give a nice even coat and allows the mixture to somewhat seep into the little crevices. Seasonings | If you feel that the seasonings don’t look like there is enough, sprinkle on a little extra. The main flavor will be on the exterior, so as you slice in the center will be more plain cauliflower in flavor so it is nice to pair each bite with the outer portion. You seriously can’t go wrong with this Ninja Foodi side recipe. If you want to try something a bit different, give it a go, and be prepared to be amazed. 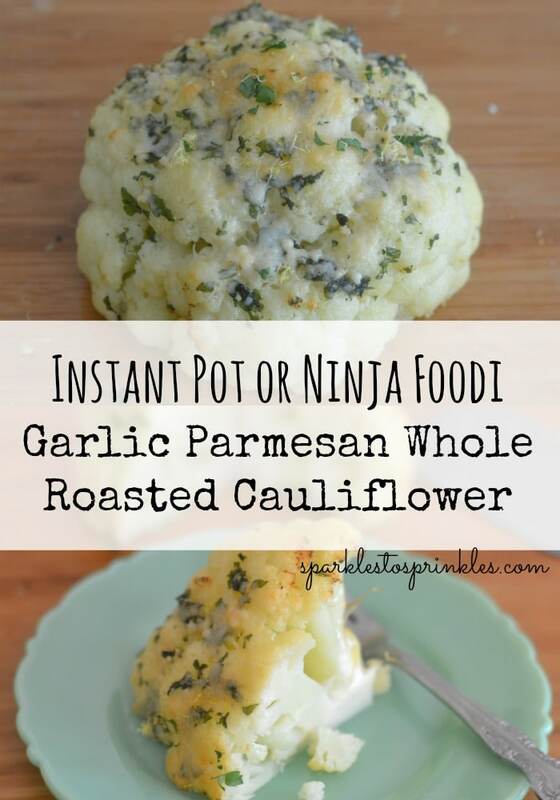 This Instant Pot or Ninja Foodi Garlic Parmesan Whole Roasted Cauliflower is so delicious. Either as a meal or as a side dish. Keto friendly and delicious! Trim leaves from cauliflower head and wash. Place on trivet in your pot with 1/2 - 1 cup of water. Combine butter, garlic, lemon zest, parsley, salt and pepper. Brush mixture on top of cauliflower. Slather it up good. Close the pressure cooking lid, make sure it’s in the sealing position and turn toggle to seal. Press Pressure (it should automatically set to HIGH pressure). Set time to 1 minutes. Hit START. When finished do a quick release. Sprinkle 2 TBSP of Parmesan cheese over the head of cauliflower. Mine took 4-5 minutes to brown perfectly. Carefully remove your cauliflower head & place on a baking sheet. Sprinkle 2 TBSP of Parmesan cheese over the top and sides. Place in the oven on broil until your cheese is starting to brown. Adapted from Spend with Pennies Garlic Parmesan Whole Roasted Cauliflower.